Adding the marked stone to form the enclosure was the second pattern intensively used by Kobayashi Koichi, in the years when he was on top of the world of go in Japan. (See Kobayashi fuseki for the first.) It has also been adopted as a signature fuseki by O Rissei. The 1-3-5 pattern may appear to be a straightforward but unremarkable play, but there is a little more to it. 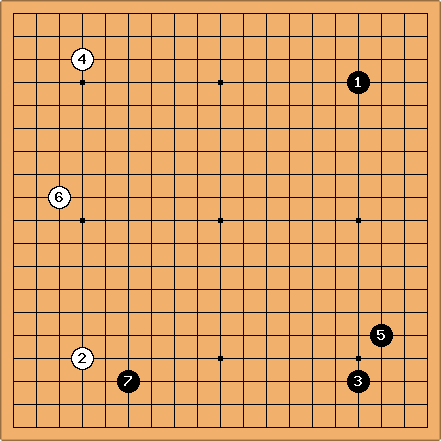 In older games Black typically enclosed the corner with a high play, . Supposing Black gets the chance to play a fourth time on this side, a would be ideal. The relationships between , , and a stone at a are beyond criticism. With Kobayashi's choice, doesn't require any further play in the area. Black may get a chance to play a big point later, at one of the marked points. With a style like Kobayashi's, this makes sense: the emphasis is on rapid development, not large-scale play. Black is secure and settled on this side even if White plays here first. On the other hand, none of the later plays Black can choose from are ideally placed. rs220675? I like this opening and I play it whenever possible as Black and White. Does someone know a more detailed view/article/book on the idea of this opening? Bill: Why Mark II? I understand that this is a second kind of Kobayashi formation, but who is Mark? rs220675? : What do Danplayers think about this opening? I realize that quite some pro's play this opening, but somehow it's not very popular though. Mark356: I'd seen this opening, too, and didn't really know what to make of it, nor did I think it particularly noteworthy. But I just did a search, and here's my theory. 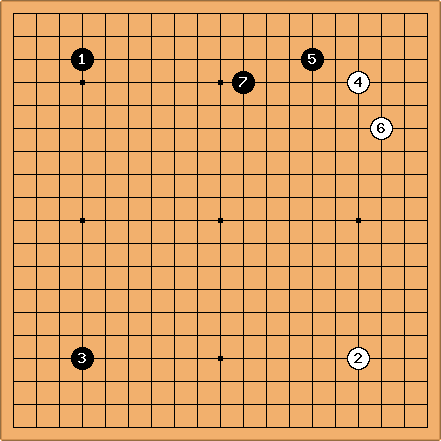 Here's the first 7 moves of a game Kobayashi Koichi played against Otake Hideo, on Sept. 30, 1992. Black's shimari in the lower right is not positioned to coordinate particularly well with the upper right corner. However, it is perfectly positioned to work with black 7.